Can you believe that this month is my five year anniversary of blogging. How did that happen?? I'll have a little introspective post up soon, but in the meantime, I wanted to share a little giveaway to thank all of you for following along these past five years. This started as a fun little side project, and it has turned into a full-blown hobby, complete with an amazing community. I can't thank you all enough. To celebrate, I've teamed up with two small businesses - one of my favorite clothing brands and one of my favorite accessories brands - Apricity and Femme De Bloom. Both have created some of the best pieces that I own, and Eileen and Melanie are two of the most inspiring business women I know. 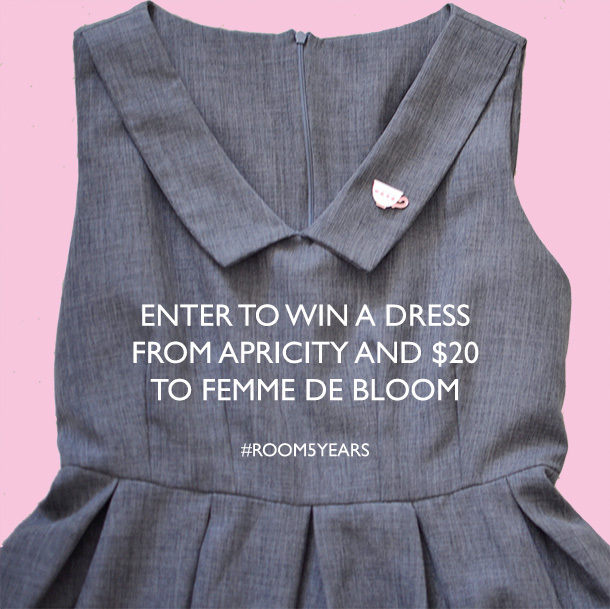 The winner will win the Apricity dress of her choice and $20 to Apricity. I'm jealous that I can't enter myself! All you have to do is enter through the Rafflecopter widget below. You have until midnight on 5/9. Good Luck! I have always admired your dresses from apricity, they are always so classic! Hi Elana, Love your blog! So glad I discovered through @shopapricity! and Congratulations on the 5 years! and Cheers to many more!! I would love the Sunday dress as well (mustard - L) and I love the Baby Groot pin from @FemmedeBloom! Thank you for the opportunity! Congrats on 5 years! I'd have a hard time choosing between a Lauren or River dress. I'd love a navy January dress with some blue and white polka dot earrings to match! I love Apricity dresses. My favorite dress of theirs at the moment is the Claire in Black! (I have the Sunday in blue.) The Posh Polka Dot earrings are so cute! My favorite Apricity dress is the Sunday. I had my eye on the grey one you posted in the header! I'm into pins and brooches lately, so I'd definitely chose one of Femme de Blooms pins. I like Handmade "Pink Rose Garden" White and Pink Floral Print Earrings 3/4" and HAZEL | BLACK dress. 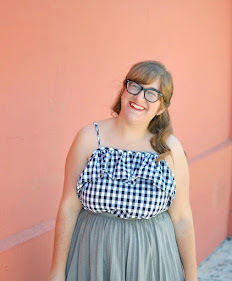 Your blog is adorable and I'm glad I follow FemmeDeBloom and found out about it. I've been drooling over Apricity's stuff for a few years now and LOVE the January dress. The hard part would be choosing a color. As for FemmeDeBloom, I've purchased from her before and would love the butterbeer brooch! I'd choose Hazel in black or Sunday in windowpane blue. Both would be great staples. 😍 And I've have to choose some of those dreamy earring from Femme De Bloom. I'd love to win a Solstice dress in black, navy, or dark red, and a GotG pin! Congrats on the 5 year blogging anniversary! Time really flies <3 Apricity is one of my favourite dress shops ever!! What a lovely blog! Congratulations on 5 years of blogging!! It's definitely a feat worth celebrating!! I truly appreciate the opportunity to participate in this great giveaway. If I win (fingers, toes and eyes crossed), I would choose Apricity's charcoal gray Sunday dress in XS. Also, I would choose the Lonely Heart chain in Femme De Bloom collection. Again thank you so much and I wish you many more years of success! Regarding your question: from Apricity, I'd pick the January in Seafoam, and from FemmeDeBloom, I'd choose the Handmade "Rebel Alliance Logo" Star Wars Inspired Brooch Pin. Such a fun milestone and fun way to commemorate it! Congrats!